How long does it take you to set up a Joomla site starting from scratch? It might take hours, days, weeks or even months for one to get it done depend on your skill sets and the initiated ideas / concepts. The more focus you put on the design, simply means the more time you're going to spend on it to make sure everything comes out right. Using JA Biz as a shortcut, you can easily reproduce a "clone" that does not just look great, but also WORKS as is in approximately way less time with the Quickstart package, indeed. Fast set-up cut down the timing tremendously. From here onward, you can simply input your database and the site is ready. Help us spread the news on JA Biz to your friends via Facebook, G+ or Twitter by using one of the following social button. This month template also featured the two popular menu systems: Megamenu, where all the categories and sub-categories are neatly organized and Off-Canvas menu, which is available on both Desktop & Mobile version. And yes, to all the recent feedback, we bring back the highly requested Back to Top button for JA Biz striving for the user-friendly navigation experience . You can decide to either go all out and keep both of these menus on your Desktop as we did for JA Biz demo, or keep only the Megamenu and retire the Off-Canvas menu on mobile, we leave this for you to decide. 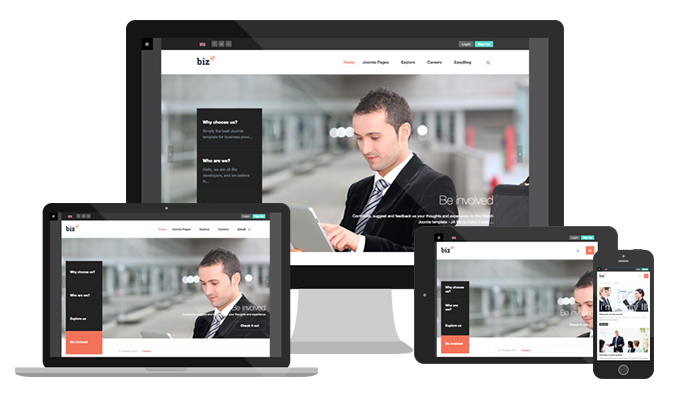 I have to admit being Fully responsive is now a must in this constantly-changing tech era. Most of my daily hours are spent on mobile and tablet, except for those time I do coding on my laptop. 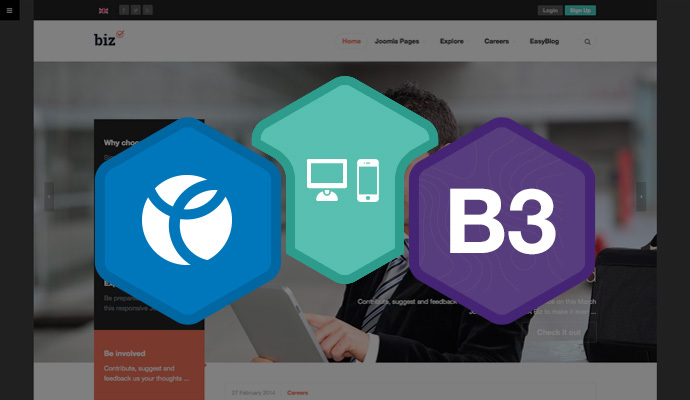 Thanks to the latest T3 Framework with Bootstrap 3 at core, which we've built JA Biz on makes the template itself fully responsive and is Right-to-left language layout ready. 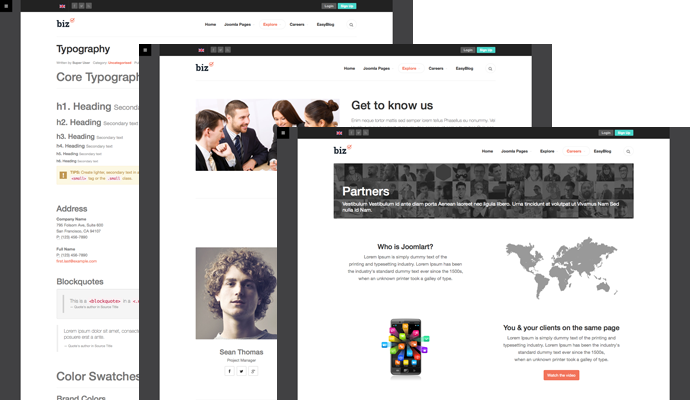 JA Biz has up to 5 beautiful layouts, including: Feature, Blog, No Sidebar, Left Sidebar and Right Sidebar, which are ready to rock out anytime. 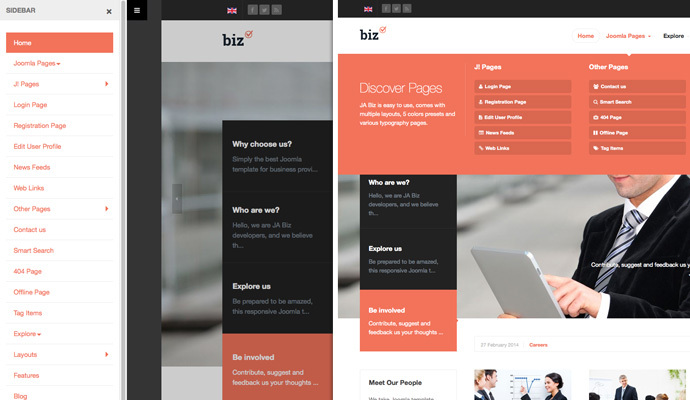 In addition, there are 6 additional typo pages specially styled to fit-in the business design. These are Pricing Table, About us, Support policy, Customer care, Get in touch and Partner. Again, we try to get you kick-start asap, and these "extras" are aiming for the same. We have been featuring K2 component for years, and recently switch over to EasyBlog for almost a year now. If you haven't used EasyBlog yet, you might not agree on the switch we made, but we believe you soon will (once you got the EasyBlog installed and play around with it). Blogging plays a crucial part in business development and customers engagement. 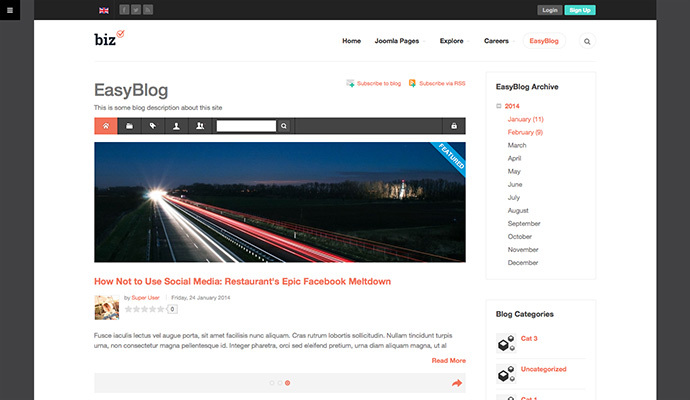 If you have been neglected your blog section for a while, it's time to get back on track. It's a long term commitment and does take time to "show" results. EasyBlog is a convenience "tool" you can rely on, so take time and be persistent. If you are trying to show off your worldwide branches, JA Image Hotspot will help you to achieve just that. It allows you to upload any image then add marker along with market's description. 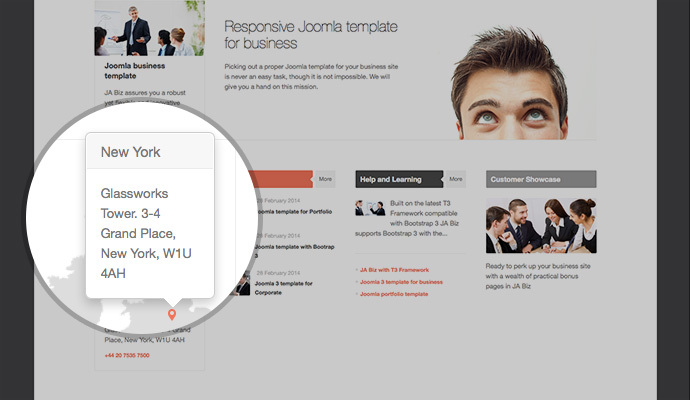 The extension is flexible and responsive yet customizable.